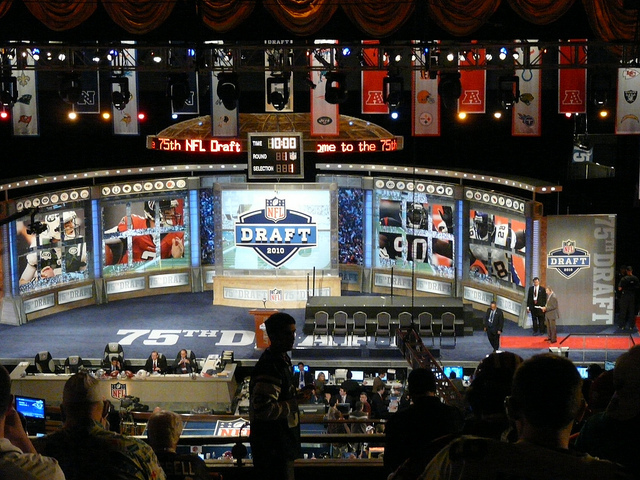 As of Wednesday, the 2014 NFL Draft is officially one month away. Draft experts like Mel Kiper and Todd McShay will continue to put out mock drafts up until the final seconds tick off on Houston’s No. 1 overall pick. Now, these mock drafts have a lot of basis — they take into account a player’s talent, a team’s need, and even whom a team might have on its big board. This isn’t to say that draft experts are always right or never right — it’s to say that there’s naturally a lot of speculation. The speculation starts with the teams themselves. For example, certain teams will have individual workouts with players whom they believe they would like to take and have a chance to select. So when a team with one of the last picks in the first round works out players who are anticipated to go in the top 10 – well, that only generates more speculation. Regardless of a team’s pre-draft actions, there’s really no way to be sure what any team might do. Instead of predicting which team will take a certain prospect, here are four potential events that might occur in the first round that most people won’t be expecting. When you consider that last year there was just one quarterback taken in the first round, this probably seems ludicrous. But in reality, that’s even more of a reason that five is plausible. There’s always a need for elite quarterbacks, as it seems like there’s always a handful of teams trying to upgrade their chosen gunslinger. And since this draft has a wealth of potential top hurlers, teams will assuredly gamble to try and pin down their future franchise quarterback. Of all the quarterbacks, the five could be Blake Bortles, Johnny Manziel, Teddy Bridgewater, Derek Carr, and AJ McCarron. Albeit Bridgewater’s stock took a dip after his performance at the combine, his highlights and athleticism reveal enough about his potential. Carr is more similar to Bortles in that he played at a smaller school with less competition, but he has terrific size and instincts to become a top NFL quarterback. McCarron is probably the biggest stretch of the five. In what he lacks in size and arm strength, though, he makes up for in accuracy and his ability to win: He led Alabama to two national titles, and he was more than just a game manager. As a whole, this is a deep class of quarterbacks who appear to have very high ceilings. The demand for franchise-caliber quarterbacks is up after last season, and that’s why, come May, we could see five taken in the first round. It’s becoming common knowledge that having an elite running back is far less important in this era of football than it used to be. Sure, if you can lock up a talented, workhorse-type of player like Adrian Peterson or Jamal Charles and focus your offense around him, you’ll be just fine. 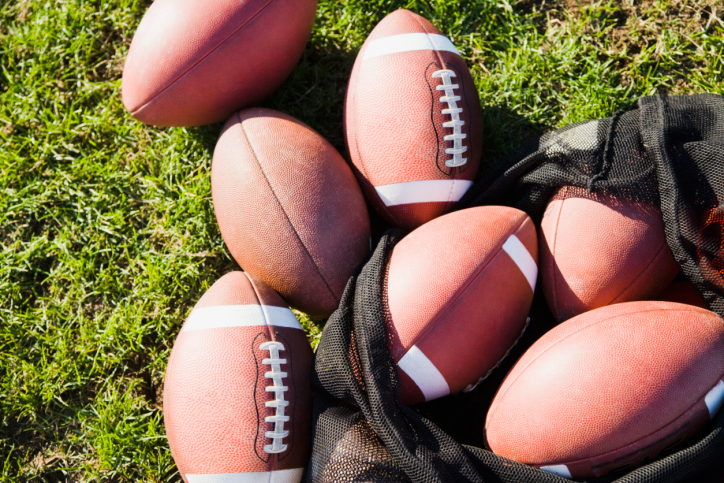 But at the end of the day, passing has become the focal point of most offenses. Again, running backs are important — there’s no doubt about that. But having a game-changing running back isn’t. Most teams use the running game to set up their passing attack, if that. Whereas teams can’t get a top offensive lineman who’ll likely come in and start at tackle in the later rounds, they can potentially draft a tailback that can get the job done later in the draft. Currently, Ohio State’s Carlos Hyde is predicted to be the top back in this draft class. While he’s a good back, it’s not likely that a team would use a first-round pick on him. Considering that most teams have a running-back-by-committee system, even if there’s a need for a running back, he wouldn’t be alone atop the depth chart. It’s not that this is a weak class of running backs — teams just would rather spend their top picks (first-round ones, in this case) on players who will alter their team as a whole. Somehow, San Francisco has slowly been hoarding picks this draft. Consider this: The 49ers have six picks in the top 100 selections, and 11 total. With so many options, they could very easily trade a few of those picks, along with their first-round selection, and move up the board. Coincidentally, this draft is very deep. That means that a team with a mid-first-round selection could have motivation to move down in the opening round and add later picks if it believes it can still get a player of choice then. 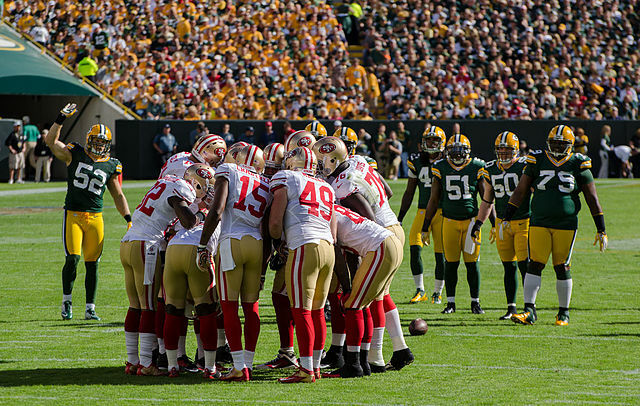 San Francisco has a lot of options with that many selections — though the 49ers don’t have a lot of need, if they get the chance to move up, they will. 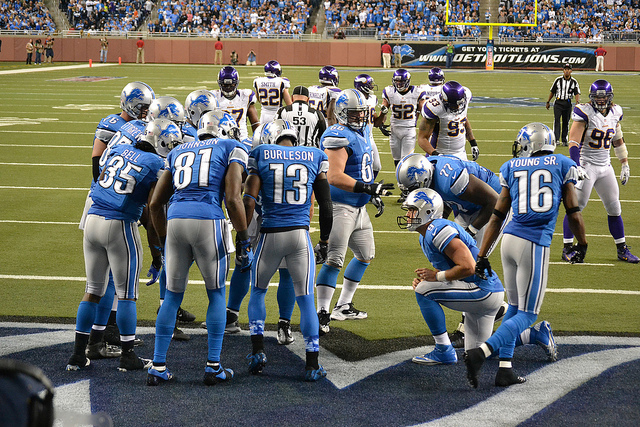 Every season, it seems the Detroit Lions have pressing needs in the secondary and other areas of the defense. Besides the defensive line more recently, there’s been a need on defense for the past decade. And it seems like every year, the team uses a first- or second-round selection to add offensive weapons. The last time the Lions drafted a defensive back in the first round was Terry Fair in 1998 … yikes. Though this was more of an issue during the Matt Millen era, the problem still remains today. While Detroit did recently draft defensive linemen Ezekiel Ansah (2013), Ndamukong Suh (2010), and Nick Fairley (2011) in the first round, the Lions also selected the likes of Titus Young and Ryan Broyles at wide receiver with second-round selections. There’s speculation that the Lions could try to move up from their 10th pick in order to draft wide receiver Sammy Watkins out of Clemson, or even try to get Mike Evans out of Texas A&M at No. 10. The belief is that either one would form a dynamic trio with Calvin Johnson and newly acquired Golden Tate. Sure, that wouldn’t be a bad move, but the team failed to address a gaping hole at cornerback from a year ago in free agency – now’s the time to do it. With the 10th pick, Detroit could get a safety or cornerback who would almost assuredly start next season with the Lions’ depleted, futile secondary. Instead, they’ll probably do as they always do: select a player based on talent and not need. While it can’t possibly get as bad as Charles Rogers (2003) or Mike Williams (2005), history tends to repeat itself, and 2014 won’t be any different from any other year.